It’s easy to get excited about your next family vacation, but you can’t assume all the pieces will fall into place simply because you know where you’re going. That’s especially the case if you’re traveling with younger and/or older family members. Trust me, been there, done that. You want everyone to look back on their time spent with family on vacation fondly. That means you have to be prepared. Whether you’re driving a few hours to Lake Tahoe or your trip involves a long flight, these tips will ensure your trip is a success. As much as you’d like to do it all during your stay, it’s important to understand that you can’t. It’s much better to plan a few things you know your family will want to do and leave the rest of your schedule open. That way, you can find fun things to do at the last minute while you’re there, or you can spend your time relaxing. It’s important to think carefully about where you are going to stay. If you opt for a hotel, you have to decide how many rooms to get, depending on the family members who are traveling with you. Where the rooms are located is an important consideration too. Make things easier by reserving a block of rooms. That way, grandma is next door instead of two floors down. If you’re looking for a different kind of vacation experience, skip the hotel and opt for an RV. Renting an RV comes with many surprising benefits, one of which is the ability to stay right on the lake. I personally like to camp. If you want to get in touch with nature, this is the place to do it. If this is your plan, be sure to check out my epic camping gear guide. Packing is always a challenge. It doesn’t matter if you’re traveling halfway around the world or you are going away for the weekend, it’s human nature to pack everything we might need, just in case. That’s a bad idea. It makes taking an airplane a nightmare, but it will also leave you spending more time digging through your bags than enjoying your time off. No one wants to organize and fold clothes on vacation! Instead, learn how to pack light. Make sure you don’t leave anything behind by making a list ahead of time. Vacuum bags can help you save space in your luggage too! Right before you’re ready to head out the door, double check the bathroom to make sure the straightener isn’t on, adjust the thermostat, and double check that all exterior doors and windows are locked. Enable your security system, or download an app that enables you to turn on your lights remotely to keep burglars at bay. It’s important to have an idea of how much you want to spend on vacation. After all, you don’t want to return home to an empty bank account and maxed out credit cards! However, you should leave room in your budget to be flexible. You don’t want to feel guilty for treating the family to ice cream! Know that it’s okay to go over your budget so you don’t beat yourself up about it while you’re supposed to be relaxing. Worried you’ll go overboard and swipe your credit cards too much? While you’re on vacation, commit to a cash-only diet so you know exactly how much you’re spending. Your family is sure to enjoy the time they spend at Lake Tahoe! That is, as long as you prepare for a successful trip before you leave. 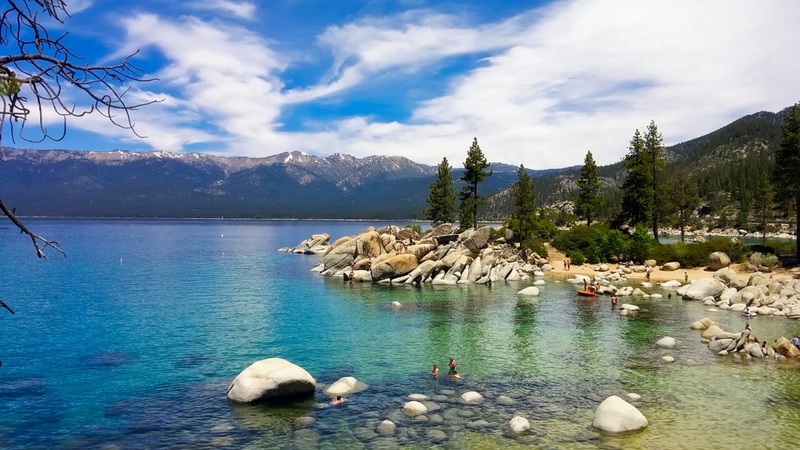 With these Lake Tahoe tips on this list, you can kick up your feet and relax knowing everything has been taken care of. Going to Tahoe in the winter? Check out my first ever ski trip there! Complete with snowmobile safari in the forest.